Unlike conventional camera lenses where the optical performance decreases as the magnification increases, this Schneider-Kreuznach macro lens was designed specifically for magnification in the range of 4X to .25X. Its mechanical stability and the robust V-mount interface enable simpler adjustment of the best azimuth position. The system is exceptionally well suited to demanding, continuous industrial use. The aperture is infinitely adjustable. Both the aperture and focus (sold separately) lock solid. We can easily adapt this lens for use with nearly any mount. Contact us for details. For sensors up to 141.2 mm. 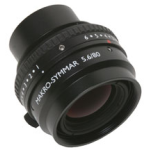 Lens has V-mount, but nearly all mount types (F, M42, etc) are available at additional cost. 138 mm minimum object distance assumes 1x magnification, and varies with mount configuration.